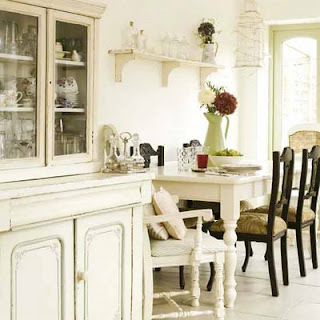 a saturday smile: Dining rooms I love... and might actually use. No matter how many things I move around, rearrange, or hang here and there, I never seem to be satisfied with my dining room. Maybe it's because these giant traditional carpet drapes were left from the previous owners or the fact that there is zero light...or maybe it's because there isn't a television visible from the table (ye with husbands understand). But regardless of the functionality of dining space, I'd at least like it to look amazing...and used. Here are some photos that I have gathered for ideas. I wouldn't mind eating...or living...in any of these beautiful spaces. 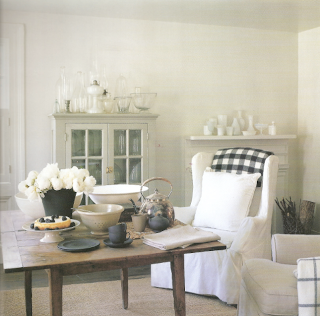 I've always loved the idea of having fluffy living room furniture in dining spaces. There's something very warm and inviting about a wingback chair at a table. I also like the idea of being able to move furniture within the room. For instance, in this space, you could eat and then push the chairs back for conversation. Choosing upholstery fabric would be fairly easy. Those with kids probably shouldn't lean towards white... however I think solid colors would be best as to not crowd the space. No one wants to eat in clutter. Those of you that really know me, probably already knew I would swoon over this idea of branches suspended from light fixtures. At our ranch house, I gathered tree branches and painted them white. I stuck them in vessels and set them on top of hutches but it never dawned on me to suspend them from the ceiling. Something like this is so striking and beautiful AND it's free, people! It's a great way to add a natural and unrefined feel to more traditional modern feeling rooms. By the way, if you plan on painting branches white, I feel they should go in rooms with dark walls. The contrast between light and dark will be unforgettable. Otherwise just use the natural dark. Spring cleaning time is here! 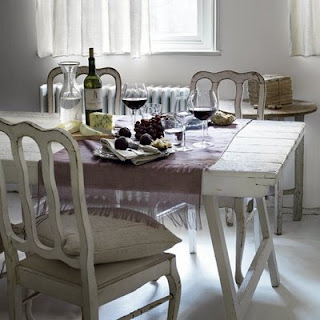 Giving your deserted dining room a good wipe down will inspire you to redo the entire space. Don't be afraid to repaint or change out drapes. Natural textures like unbleached linens and burlap are my latest fascination for window treatments. I'll have a post about that soon. These fabrics are easy to manipulate and are incredibly affordable.